What inspired you to knit it? I was looking for a linen shawl to knit (and teach a class on) and liked the crispness of not only the linen but also the different stitch patterns. What yarn did you use? Montoya Beach from Punta Yarns – a beautiful pure linen yarn. Did you enjoy knitting this pattern? Yes! The stitch pattern changes so often that you never get bored. What do you like most about the finished project? I love how the linen softens up after washing. 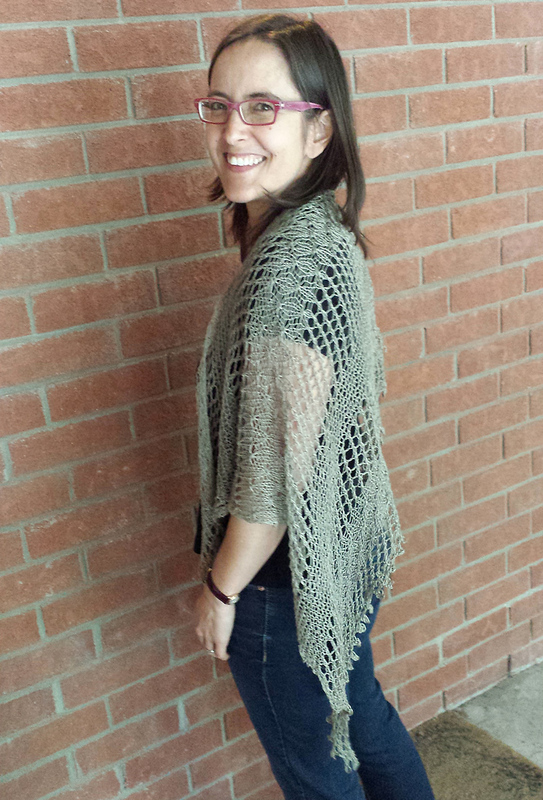 And I enjoy its asymmetric shape (after having knit quite a few traditional triangular and crescent shaped shawls). Would you knit this again? Yes. I could also see myself knitting this as a gift as it is a quick project with nice results. We’ve actually knit this shawl as a store sample with Quince and Co’s linen yarn Sparrow and love the interplay of the different stitch patterns in this lightweight accessory. As expected, the linen gives the shawl a crisp structure, lovely drape, and a cool, dry hand – all amazing qualities in warmer weather. Shop Montoya Beach in our online store.